​32 years ago - Brian Markov is born the crown prince of Markovia. ​25 years ago - 7-year-old Brian's half-sister Tara is born. ​20 years ago - 12-year-old Brian is placed under the care of Dr Helga Jace to develop his inherent metegene. ​15 years ago - 17-year-old Brian's sister Tara is sent away to live with her mother in America. 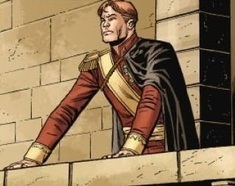 ​11 years ago - 21-year-old Brian takes his place as the ruler of Markovia. ​8 years ago - 24-year-old Brian thwarts an overthrow attempt & joins the Outsiders as Geo-Force. 6 years ago - 26-year-old Brian's mind is overwritten by the implants placed in his skull by Dr Helga Jace. He is used to defeat Outsiders & dies in the aftermath. Geo-Force is such a straightforward character concept, it's almost hard to take him seriously. 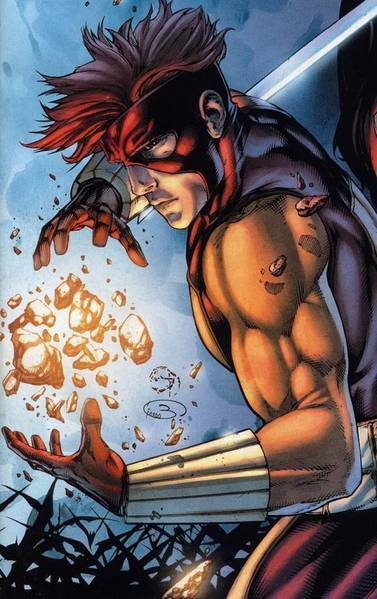 His design is incredibly basic, and his powers seems specifically built as 'generic leader character'. Still, there's groundwork in his concept for a competent writer to craft something compelling, specifically in his role as a leader of an entire nation, and in his relationship to his half-sister, Tara, a character whose role in comic book history can't be overstated. We've chosen to let his story focus primarily on his original career in the Outsiders, as these really are the best parts of his story. Everything else has been, at best, a valiant effort to make him relevant, most notably his completely purposeless inclusion in Brad Meltzer's weirdly awkward Justice League. We've also made the decision to use the brainwashing of Geo-Force as the catalyst for the end of the original lineup of the Outsiders. It wipes away the ongoing effort to bring the character back. By keeping his career brief, he can be a true hero with an ignoble end, as befitting a tragic king.